Manga artist Akira Toriyama must have some strange fetish for dragons. If you are an American anime fan and you haven’t been living under a rock for the past decade or so, you are probably familiar with his Dragonball manga franchise. But video game fans will also be familiar with him providing the character designs for Dragon Quest, a Japanese RPG franchise that has been around since the mid-80′s and still continues to be produced to this very day. In late 2006, Toriyama provided his familiar character designs to Blue Dragon, a new RPG for the Xbox 360. This was significant for two reasons. 1) It was one of the first Japanese RPG’s on the Xbox 360 and 2) the Japanese don’t play the Xbox 360. 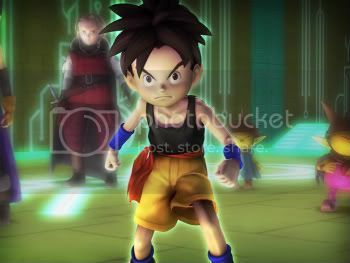 But the game sold moderately well in Japan, which lead to the need to expand the franchise to be just as popular and have the same longevity as Toriyama’s previous Dragon projects. Along with a shonen anime series (currently available for free on XBM and iTunes), Mistwalker studio teamed up with Brownie Brown to put together Blue Dragon Plus, a sequel to the original game. However, this time around they are going portable by releasing the game on the Nintendo DS. Plus takes place a year after the events of the original game. 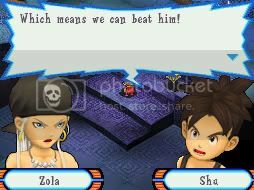 Shu, the game’s main protagonist and young-Goku doppelganger, is living in peace with his friends after they have defeated the evil villain Nene. However, Nene is not actually dead, and when he takes away the soul of Shu’s robotic friend, Shu is once again on the quest to get his old pal back. He’s joined up all his other friends from the first game, and they split up to fight all the evil monsters and robots that stand in their way. 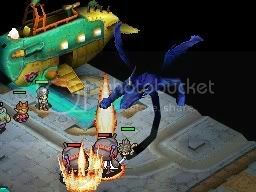 At its core, Blue Dragon Plus is a completely different game from its Xbox predecessor. While the original utilized a turn-based fighting system that is common in Japanese RPG’s, this version becomes a real-time strategy game, which are much more common in war simulation game. But much to my surprise, this genre mash up actually works very well. You start off each battle with a party of your allies. Each character has their strength and weaknesses, which the game will explain to you as each ally is added to your party. You can then command one, some, or all of your characters to move around the battle map area. Once a character is within range of an enemy, they begin attacking the foe. At that point, you can cast spells, heal, use items…. all the things you’d come to expect from an RPG . You can move around the battle map to collect items and coins, or you could go back to past battles to do some “grinding” and level up the members of your party. I did find one major issue with the touch screen controls. After you select a character, you could either a) click on the screen to move him to that spot on the map or b) click on an icon to cast a magical attack on the enemy. However, if you miss clicking on an icon even by a little bit, it assume you meant to move the character to the area next to the icon, and he will start moving there. This happened to me a lot in the game, and if you are in the middle of a battle, this blunder could force your character to turn his back on the enemy, leaving them prone to attacks. This was incredibly frustrating, and does leave a very poor mark to an otherwise fun gameplay combination of two different genres. The story is also surprisingly good. 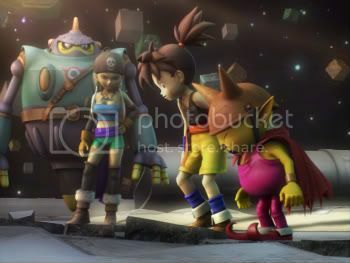 While the DS cannot render the characters and cut-scenes in the same 3D way as the original game did on the Xbox, the designers decided to pre-render the characters using 3D CGI animation rather than using the same 2D anime style of the TV show. For every FMV cut scene and in game dialogue moments, you see a 3D character instead of a 2D drawing, which is a little unusual but I gradually found myself enjoying as the game progresses. From the point-of-view of an anime fan, I also really enjoyed seeing Toriyama familiar looking character designs within the game. Even if you are unfamiliar with the original game, the story will slowly reintroduced to you each of the characters and provide for you their background story. There is great level of character development and plot twists to keep you interested. While the cast grow fairly large a few hours into the game, you do find yourself enjoying the company of humans, aliens, robots, cute talking animals, and pink piles of poo. Yes, pink piles of poo. And that would be the only downside to the story that I can find. For humor and comic relief, the story often turns to immature potty humor. While others might find this funny, it left me with a feeling of disgust. I would be okay with it if this was an infrequent occurrence in the game, but eventually the Poo become one of your alleys and you have no choice but to study his character to determine how best to use him in battle. Toriyama’s familiar character designs, engrossing storyline, pre-rendered CGI cut scenes, and interesting real-time strategy game play. Childish toilet humor and frustrating touch screen screw-ups that always seem to come up the heat of battle. 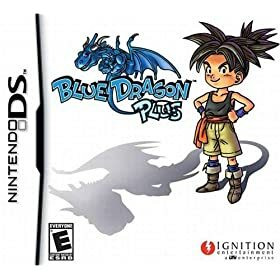 A real-time strategy take on a Japanese RPG makes Blue Dragon Plus a much different experience from its Xbox predecessor, but I am very surprised at how much I enjoyed it. I can fully recommend it to fans of the previous game or to fans of either video game genre. This entry was posted on Monday, March 2nd, 2009 at 8:33 pm by Scott	.